Most of my life I have done some form of gardening. And organic gardening would be the natural way to go, right? But I soon realized that if “organic” means introducing “beneficial” insects, which would dispatch other insects regarded as pests, that is still killing. For me, as a Buddhist practitioner, this was simply not right. So what to do? I know my garden will inevitably and naturally have beneficial insects in it, so I play mantras and display holy images so that they – and other predators which may wander into my garden – may be triggered to take a higher rebirth. Of course, I also discontinued use of all insecticides and chose native plant species that would attract a myriad of native creatures. The result: I have a garden teeming with wildlife. I became particularly interested in how to create a habitat for animals displaced by the rapid rates of urban sprawl. 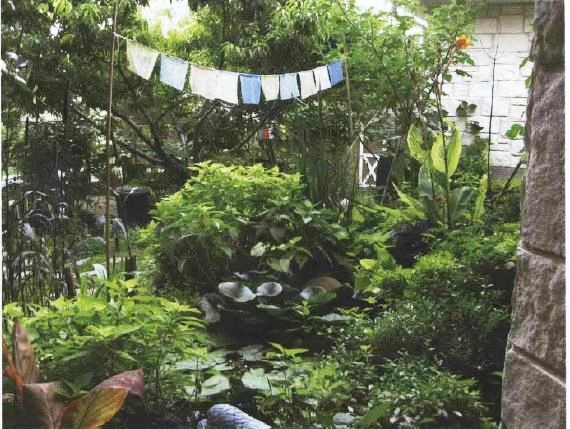 Sara Stein, in her book Noah’s Garden, discusses how to become an “un-gardener”. Tolerance for wildlife in all its forms is necessary for this to work. It is not about tidy or formal gardens. It’s about creating natural habitat. We used native plants more and more, designing a garden with irregular shaped beds and paths, just as nature does. The outcome is amazing! Creatures are naturally attracted. It took a few growing seasons, but one night there she was, a mother sentient being: a fox and her two pups! She was living under our shed in her den. Later, corn and rat snakes, skinks, anoles, fence lizards, an armadillo, opossums, a cuckoo bird, woodpeckers, toads, frogs, and a large array of insects began to make the garden their home. Sadly, though, most of these creatures eat other creatures. Some might say, “That’s great! The snakes eat the rats; the fox eat the snakes; the lizards eat the toads,” but this is nothing to rejoice about.